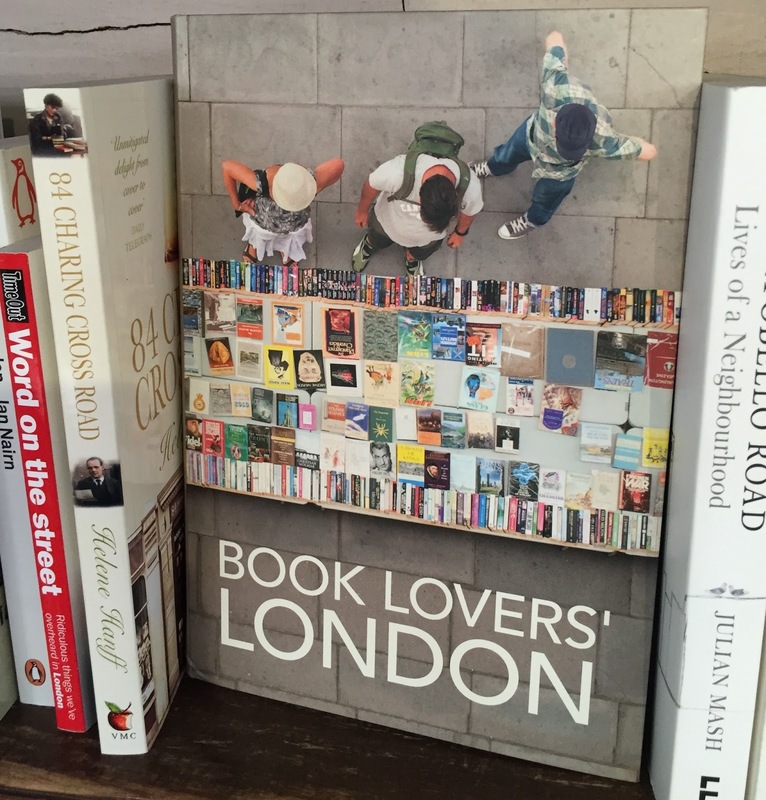 Cast your minds back to last summer and you may remember I took my then unsuspecting new boyfriend on his first ever bookshop crawl. 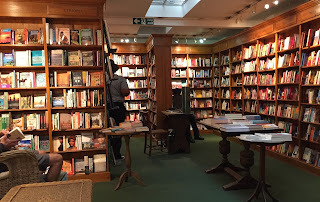 It was a brilliant – if exhausting – day that saw us go home with a mountain of books, three of which were purchased at this week's bookshop: Daunt in Marylebone. As a way of easing him into the bookshop crawling madness, I'd given my boyfriend a certain amount of control over the route, letting him name bookshops or areas he knew and would like to visit and this was one of the places he named. 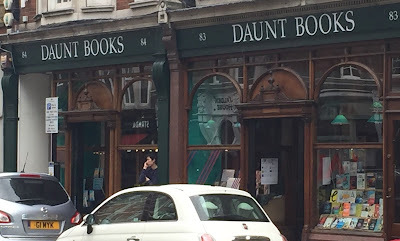 In all my bookshop blogging days the Daunt flagship shop has been a place I knew I needed to visit so I eagerly accepted his suggestion. Photos of the main room look like somewhere from another time and the hushed tones in which this hallowed bookshop is talked about make it seem like the indie royalty of London's bookshop community. Which made me a little surprised when I was led to a busy street and an unassuming shop front. As much as I trust my boyfriend, I couldn't help wondering if the lack of flags and fanfare meant he'd got his bookshops muddled up. Even so it was still a bookshop – and one I'd not been to before – we went inside. First impressions were of a smart, modern room with a heck of a lot of customers. Pale walls and dark wooden shelves lend the entrance an air of sophistication while all those bookshoppers provided a welcoming buzz. Which was all very well, but where was the huge, two storey room I'd seen in all the photographs? Just as I was about to get huffy, stamp my foot and say we were in the wrong (admittedly lovely) bookshop, the crowds parted and I was given a view of how far back the bookshop stretches. 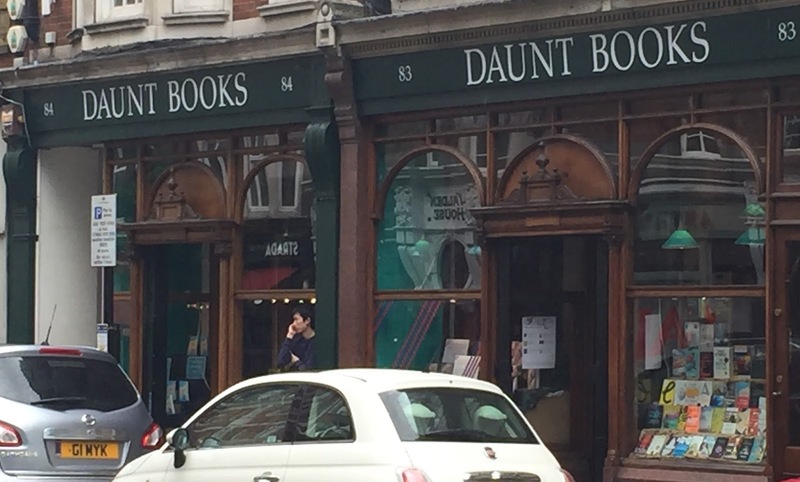 Daunt is massive, and that wonderful old-fashioned room with its great big window draws browsers back, taking you away from the crowds and into the world of (and in) books. 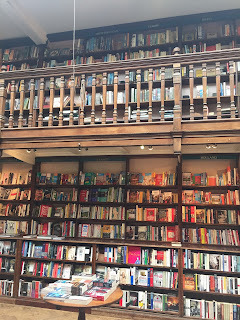 True to Daunt style as a travel bookshop, fiction and non-fiction are arranged by country, with the ground floor of the striking, famous room the main event for Europe. We made our way around the continent, enjoying the surprise of geographical affiliations and suddenly back tracking when we remembered an author from X or Y and wanting to find out more. 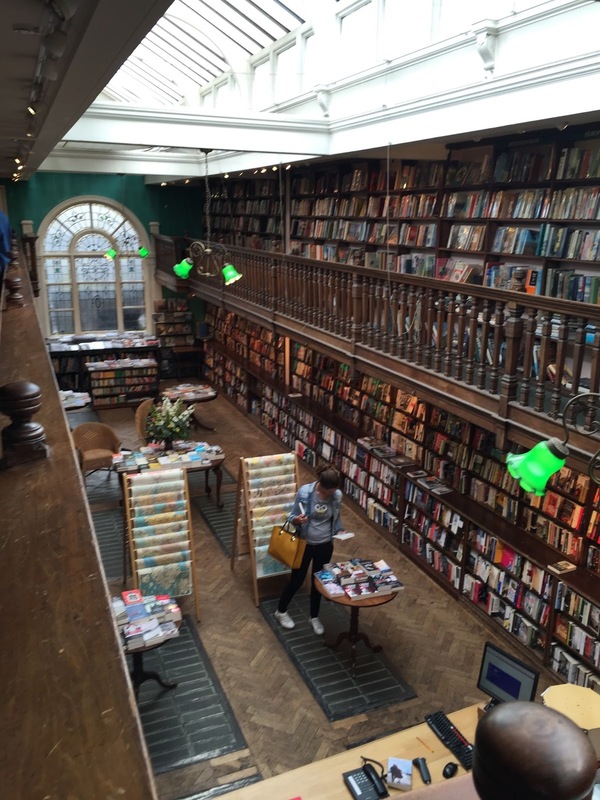 It's not your traditional bookshop format but does succeed in forcing you out of your comfort zone, making you pay more attention to the countries you read. Of course, it's also a stunning room to be in. In some ways it made me think of the traditional gentleman's study from history with the dark wood, scattered chairs and green light fittings, but the large skylight above and the bright colours of the books bring the period features into the modern world and make me want the room for my own personal library. The size of the room also meant it felt much less crowded than what I came to think of as the foyer, meaning browsing was calmer and more relaxed. I particularly enjoyed climbing the stairs to one side and exploring the second floor balcony. Arching around three sides of the room, this helps with the illusion of tall bookcases and further scatters browsers. In all, it's a wonderful space. And that's before you even go downstairs to the continents beginning with A.
Daunt is a massive world tour and somewhere I could happily lose myself in for hours, however if time is short you could still simply pop into the front of the bookshop, where the children's section and some standard fiction and non-fiction areas can be found. Admittedly, these are small in comparison to the rest of the bookshop but they are still very well stocked and varied enough to appeal to most reading tastes. Having spent a while exploring, our purchases came from Europe. My boyfriend found himself in Germany – buying Buddenbrooks by Thomas Mann – while I made a beeline for Portugal and the works of Jose Saramago*, where I picked up Skylight. 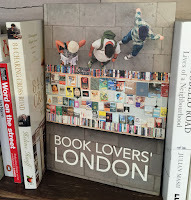 I then also spotted the London Bookshop Book** and had no choice but to break my one book per shop rule. From its ordinary shop front I can easily believe many would arrive at Daunt without realising the size and beauty of what's to be found inside – I certainly never suspected and I'd seen the photos – but don't be deceived, paradise awaits. *If you've not encountered him before then I urge you to go and buy Blindness at the first opportunity. **I'm still working my way through this book to see how many of these I've visited. It's a great inspiration but also occasionally quite sad to see how the landscape has changed in the few years since it was published. Thank you for the José Saramago recommendation. I have just bought Blindness. Sounds like just my thing. Interesting to see some of his books have Tom Gauld covers - one of my favourite cartoonists. Oh excellent. I do hope you enjoy it (but either way please do let me know). The writing style takes a little getting used to but all of his books that I've read so far have left me contemplating them for a long time after - I love how much his books make me think. PS. Am now looking up (and enjoying) Tom Gauld's work. 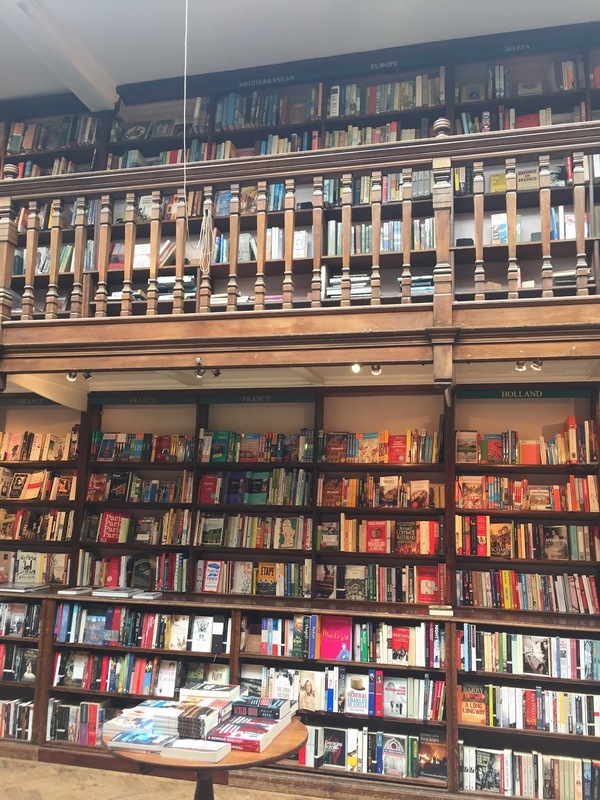 I think this may be my favourite bookshop ever, everything about it makes me happy and I've probably spent more time in it than any other book shop.